When considering potential hydro projects for Next Generation Hydro there are many factors to balance. The technical team must consider the need for electricity in 20-50 years, where the load will be, and how industrial development and potential transmission affect our choices. The technical team has completed all three phases of the Site Screening Process. 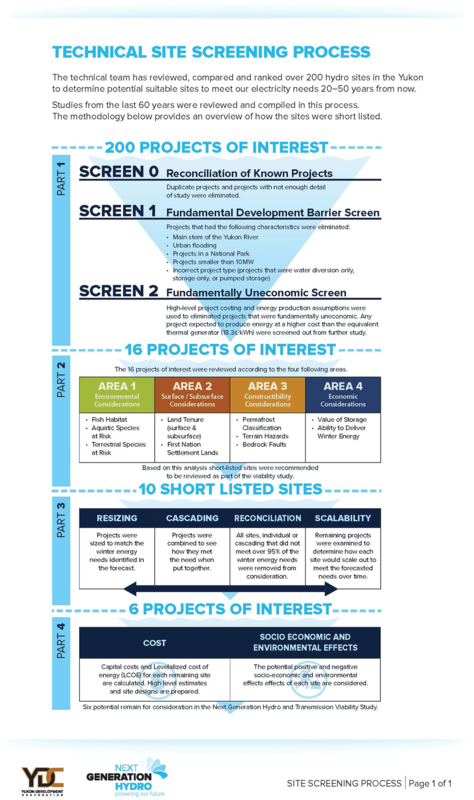 See the chart below for a description of each screen and how projects were reviewed and removed from the list for future consideration. Six short listed sites remain as the only sites among 200 that met the criteria for further study. Visit the interactive map to learn more about the sites that remain, their costs, potential positive and negative socio-economic effects and more. This technical paper documents the site screening process and the results of the first level of site screening. This technical paper documents the methodology for further screening of the sites and share results of the shortlisting process. This technical paper will integrate work from the technical papers and feedback from various sources (Stakeholders, First Nations, YDC) into an integrated umbrella document that synthesizes these inputs into a viability study. This document will aid in the selection of the next hydroelectric and transmission project (or projects) to meet the Yukon’s growing energy demands.